A few weeks ago, I was reading about the experimental confirmation that gravitational waves predicted by Einstein more than 100 years earlier did truly exist. Until Einstein developed his revolutionary theories, physics was a lot simpler, but it also couldn’t explain a lot of things. Likewise 20 years ago, the world of nutrition was also a lot simpler, but it also couldn’t explain a lot of things, like our obesity crisis. “Fat makes you fat” – Popularized by Dr. Dean Ornish, it was claimed that fat was the “evil one” and unless you almost totally restricted fat (and its fellow traveler protein) then America would be doomed. “Carbs make you fat” – Popularized by Dr. Robert Atkins, here it was believed that carbohydrates were the “evil one” and that if you simply replaced carbs with fat (especially saturated fat), all would be well. Each theory also implied that if you removed the appropriate dietary “evil one” then you could eat all the food you wanted and never gain weight. This was a very attractive concept to most Americans. “Inflammation makes you fat” – Obviously, this concept is lot more complicated than simply removing one of the “evil ones” (i.e., carbs or fat) from your diet. Why is this complicated? Because I was talking about inflammation in the blood, the brain, and in the gut. In addition, I didn’t try to sugar coat the fact that you still had to restrict calories to lose weight. However, I predicted if you followed my anti-inflammatory Zone Diet, you would never be hungry even while restricting calories. Fortunately, I didn’t have to wait 100 years like Einstein to see my predictions about lack of hunger on the Zone Diet being proven. That hypothesis was confirmed by two Harvard Medical School studies published within five years of the initial printing of The Zone. Since these three competing dietary theories in the mid-1990s were so clearly defined, I had high hopes of putting together a national tour with Ornish, Atkins and myself to be the dietary equivalent of the Three Tenors. Unfortunately, both Atkins and Ornish loathed each other to such an extent that my grand tour idea was never going to happen. The reason for even thinking such a tour was even possible was that neither Atkins nor Ornish were really totally wrong. Rather, it was their emphasis on either excess carbs or excess fats coupled with eating far too many calories that caused their theories to fail, because either approach would ultimately lead to excess inflammation. This is because excess carbs will make you fat as they increase insulin levels. Insulin is the hormone that makes you fat and keeps you fat. The same is true of excess fat, especially palmitic acid (the primary fatty acid in saturated fat) because it causes inflammation. Finally, excess calories also cause inflammation in the appetite control center of the brain. This inflammation in the hypothalamus results in excess hunger, and it is very difficult to cut back on calories if you are always hungry. So let’s see how these three leading theories from the 1990s stack up when you compare them. If you only looked at percentages of calories in each dietary approach, they do appear radically different. Obviously someone is right, but who? If you add in the calorie restriction aspect of the Zone Diet (let’s say 1,500 calories per day), then a very different picture emerges when you look at the daily intake of carbohydrate, protein and fat in grams of each of the three diets. Consuming 1,500 calories per day on the Ornish diet would make you protein-deficit by any known dietary standard. In addition, eating 300 grams of carbs per day is a sure-fire way to increase insulin. Finally, 17 grams of fat per day on the Ornish diet would make every meal taste like cardboard. On the Atkins diet, the amount of protein consumed is identical to the Zone Diet. You need this amount of protein to help control hunger, and this is why the Atkins diet is initially satisfying. However, the combination of high fat intake (and mostly composed of saturated fat rich in palmitic acid) is 300% greater than the Zone Diet, and the low carbohydrate intake on the Atkins diet begins to add up to longer term hormonal disturbances. In particular, it was recently shown by Harvard Medical School that maintaining the Atkins diet for three months eventually increases cortisol (another hormone that make you fat) as well as decreasing thyroid levels (that also makes you fat by slowing down metabolism). By comparison to these two extreme dietary theories of Ornish and Atkins, the Zone Diet seems incredibly reasonable and balanced. The absolute amount of protein consumed on the Zone Diet is remarkably similar to what Americans are currently eating, but spread evenly throughout the day so you are never consuming excess protein at any meal. The absolute fat content on the Zone Diet would qualify it as a low-fat diet based on government dietary guidelines. Plus, the amount of carbohydrates on the Zone Diet is is sufficient to keep the brain satisfied (the brain uses glucose as its primary energy source), but also not supplying excess carbohydrates to over-stimulate insulin as on the Ornish diet. The two most important revolutionary breakthroughs for the Zone Diet was its ability to reduce inflammation as well as to prevent hunger even while restricting calories. Unfortunately, people treat diets like the latest fashion. If it’s not new, it must be outdated. Today we’re back to the same situation with regards to our new epidemic of diabetes, as well as our ongoing obesity epidemic. And the old Atkins and Ornish diets have simply taken on new names. The “new” proponents of high-fat diets believe that saturated fat (especially butter that is rich in palmitic acid) is really good for you. Maybe a little research on their part might change their thinking. All you have to do is go to the National Medical Library website (it’s free) at PubMed and search for “palmitate-induced.” You’ll find more than 600 scientific references of how palmitic acid induces inflammation. Or, simply read my most recent review article on the role of fatty acids in insulin resistance. The New Kid on the High-Carbohydrate Block is the DASH diet. It’s regularly voted as the best overall diet by the U.S. News and World Report, and is the kissing cousin of the Ornish diet. The DASH (Dietary Approaches to Stop Hypertension) diet was developed to reduce blood pressure. Along the way, it somehow got morphed into the second coming of the Ornish diet because it had a lower fat and protein composition than the Zone Diet, but a higher carbohydrate content. Did I Predict this 20 Years Ago? Precisely. I had to chuckle when I read the most current issue of the American Journal of Clinical Nutrition on what happens when you take the DASH diet and make it more like the Zone Diet by replacing carbohydrates with fat. The result was that there was no difference in the reduction of blood pressure between the standard DASH diet and its “high-fat” cousin (aka the Zone Diet). Meanwhile, there were major cardiovascular improvements in cardiovascular health by reducing lipoprotein levels simply by lowering the carbs and increasing the fat – just as I had predicted 20 years earlier. 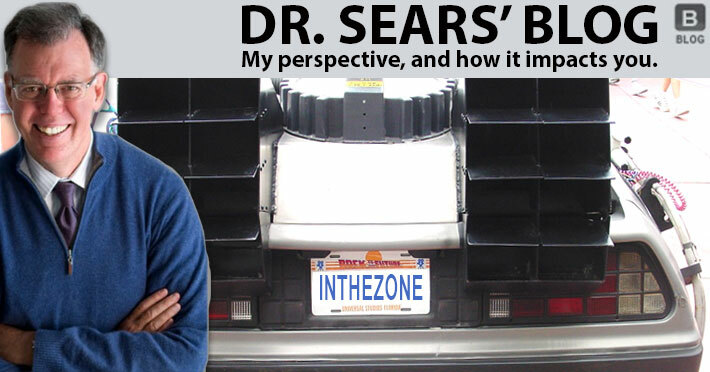 So maybe it’s time to go back to the future with the Zone Diet. Since I’m still around, I have the satisfaction of saying, “I told you so.” It’s been more than 20 years since demonstrating a dietary way out of our health care crisis created by diet-induced inflammation. Yet, our current twin epidemics of obesity and diabetes are the consequences of no one listening. Ludwig DS, Majzoub JA, Al-Zahrani A, Dallal GE, Blanco I, and Roberts SB. “High glycemic index foods, overeating, and obesity.” Pediatrics 103:E26 (1999). Agus MS, Swain JF, Larson CL, Eckert EA, and Ludwig DS. “Dietary composition and physiologic adaptations to energy restriction.” Am J Clin Nutr 71: 901-907 (2000). Zhang X, Zhang G, Zhang H, Karin M, Bai H, and Cai D. “Hypothalamic IKKbeta/NF-kappaB and ER stress link overnutrition to energy imbalance and obesity.” Cell 135:61-73 (2008). Ebbeling CB, Swain JF, Feldman HA, Wong WW, Hachey DL, Garcia-Lago E, and Ludwig DS. “Effects of dietary composition on energy expenditure during weight-loss maintenance.” JAMA 307:2627-2634 (2012). Pereira MA, Swain J, Goldfine AB, Rifai N, and Ludwig DS. “Effects of a low-glycemic load diet on resting energy expenditure and heart disease risk factors during weight loss.” JAMA 292:2482-90 (2004). Pittas AG, Roberts SB, Das SK, Gilhooly CH, Saltzman E, Golden J, Stark PC, and Greenberg AS. “The effects of the dietary glycemic load on type 2 diabetes risk factors during weight loss.” Obesity 14:2200-2209 (2006) . Johnston CS, Tjonn SL, Swan PD, White A, Hutchins H, and Sears B. “Ketogenic low-carbohydrate diets have no metabolic advantage over nonketogenic low-carbohydrate diets.” Am J Clin Nutr 83: 1055-1061 (2006). Chiu S, Bergeron N, Williams PT, Bray GA, Sutherland B, and Krauss RM. “Comparison of the DASH (Dietary Approaches to Stop Hypertension) diet and a higher-fat DASH diet on blood pressure and lipids and lipoproteins: a randomized controlled trial.” Am J Clin Nutr 103:341-347 (2016).